What happens to women when you cheat on them, fight them for child custody or deal their child a terrible health condition? They turn into supermarket robbing CRIMINALS, right?! Well, look, no. They usually don’t, but this brand new Netflix series imagines women turning to crime when challenged – and we’re enjoying its escapist gangster adventures very, very much. Let’s face it, who hasn’t idly wondered if there was a better way to rustle up the money for those ever-increasing Winter heating bills or childcare fees? Just me? In Good Girls (on Netflix) a brilliant cast of women lead the charge, trying to build better lives for themselves and their families … via a brand new life of crime. We won’t reveal too much of the plot, because every episode of season one is now available for your viewing pleasure. 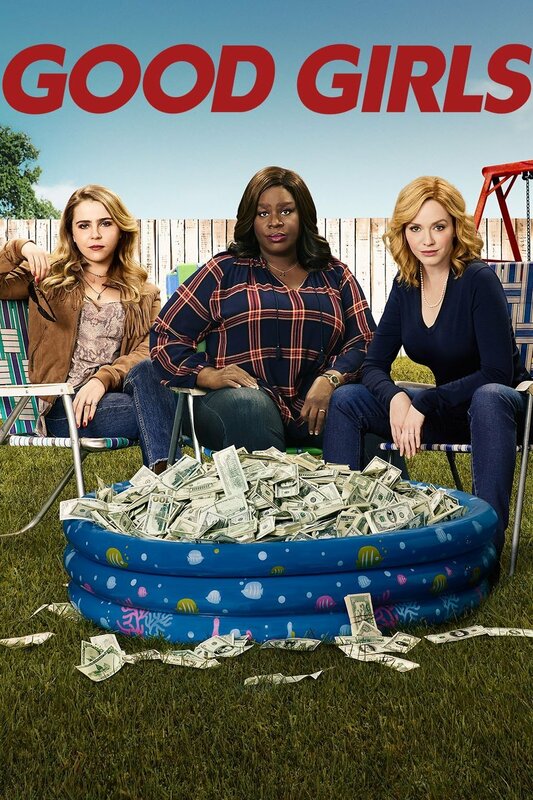 What we can tell you is that Good Girls stars Mad Men’s Christina Hendricks, Mae Whitman of Parenthood fame and Retta who played Donna in Parks and Recreation. With a cast like that, how could you miss it? The answer is you can’t! Christina Hendricks character Beth is a strong yet acutely disappointed wife. Mae Whitman plays Annie, the courageous and compassionate single mum of a gender fluid child. Retta’s character Ruby is parenting a child with a chronic health condition. Okay, it sounds a little depressing, but it’s actually more of an Oceans 8 type story of women doing what it takes to take care of business for their kids. The men in Good Girls – kind husbands, loser husbands, exes, attractive gangsters, switched-on policemen, insufferable bosses, placid workmates – play second fiddle to the ladies, and we couldn’t be happier because the women are very complicated and entertaining. They’re making the kind of questionable decisions for the greater good that most real-life mums would never choose. And it’s very addictive to watch it all play out. Cathartic, even. Good Girls, season one is up on Netflix right this minute. Grab some popcorn and a fancy drink and settle in for a pace-y ride. NB: Season 2 is on the way!